(Newser) – Eight lines have broken many hearts. 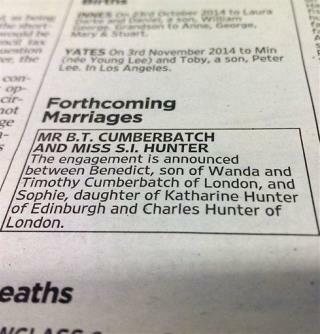 Sherlock star Benedict Cumberbatch and theater director Sophie Hunter announced their engagement today, making the news public with a minuscule eight-line announcement on the births, deaths, and marriages page of the Times of London. Cumberbatch's spokeswoman, Karon Maskill, confirmed the engagement. Now THAT is a class act that Hollywood should try to emulate more often ! ! ! How come when my sister got engaged, that it wasn't on Newser? Nobody know who she is either. "Cumberbatch Announces Engagement the Old-Fashioned Way" Umm... With a shotgun to his back?